STS-130 crew members pose for a portrait in the Harmony node following a joint crew news conference with the Expedition 22 crew members. Pictured on the bottom row are NASA astronauts George Zamka (center), commander; Terry Virts (left), pilot; and Robert Behnken, mission specialist. 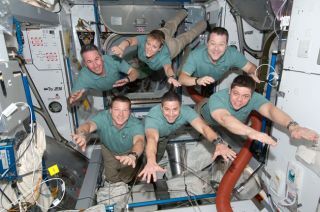 Pictured from the left (top row) are astronauts Stephen Robinson, Kathryn Hire and Nicholas Patrick, all mission specialists. Astronauts love doing zero-G stunts on the InternationalSpace Station, but only after the urge to vomit from space sickness has faded.Now fish, snails and other animals could help understand whether living inspace can create long-term or even permanent damage in the inner ear. Scientists found that the inner ears of toadfish havehigh sensitivity to even the slightest movements, and that the toadfish braincan both boost and reduce signals from the sensitive inner ear. Because humanshave very similar ear structures to these and other animals, toadfish couldprovide clues about how astronauts' inner ears adaptto spaceflight. "You can drop a fish's inner ear right into a humanand it fits right in there," said Richard Boyle, a biologist at the NASA Ames Research Center in Moffett Field, Calif. Humans doeventually adjust to living in a weightless environment. But their innerears have to go through a second round of readjustment to full Earth gravityonce they return — and scientists still don't know how easily the inner ear canmake that switch after longer space missions. Boyle's work is detailed in a study published in theFebruary issue of the journal Proceedings of the National Academy of Science.His co-researchers included lead author Stephen Highstein, a marine biologistat the Marine Biological Laboratory in Woods Hole, Mass., and Richard Rabbitt,a bioengineer at the University of Utah in Salt Lake City. Living beings evolved inner ears with hair cell sensoryorgans that can detect sounds as well as movements of the head. The balancesensory organs include tiny ear stones made of calcium carbonate that act assmall weights because of gravity. When the head moves, the inertial lag of such stonescreates force on the hair cells ? not unlike how car passengers will feel thepress of inertial lag when their vehicle jerks forward from a standstill. Thatsignal gets amplified so that the brain automatically registers even thesmallest head movements. The inner ear similarly detects bigger events such asthe sudden drop when a person steps off a curb. The system works beautifully on Earth, but quickly leadsto disorientation and nausea for spaceflyers who first experienceweightlessness in space. "When you're up in space, you still have mass but noweight," Boyle told SPACE.com. "So you can't detect gravity,and the structures sensitive to inertial acceleration and orientation withrespect to gravity lose their properties." Inner ears go haywire for a few days before the braintakes charge to regain a sense of balance. The nervous system also beginsboosting the signal strength from the inner ear, so that the human or animalbecomes hypersensitive to movement. That works until astronauts return to Earth and becomeincredibly sensitive when just taking a step or turning their heads. Boyle hasseen a similar hypersensitivity in snails that have returned to Earth afterlaunching aboard Russian space missions. Humans' ability to adapt quickly to the feelingof zero-G has proved a blessing for now, even if it baffles scientists. Ourspecies has necessarily adapted to changes in predators and climate throughouthistory, but there's no obvious reason for why it should adapt so quickly tochanges in gravity. "The brain probably begins right away," Boylesaid. "It's amazing when you think that for all of human history on Earth,gravity has always remained the constant." Boyle also noted the darker possibility that the brain'seagerness to adapt to the lack of Earth's gravity may prove harmful in the longrun. Perhaps a point of no return exists where the inner ear and brain adjustspermanently to zero-G, and the body simply breaks down and absorbs the earstones. Some human patients on Earth already suffer fromdizziness and other conditions because their ear stones begin breaking down.But scientists remain uncertain whether astronauts could suffer the same fatefrom living in space too long. The current record for living in space goes to cosmonaut ValeriPolyakov, who spent almost 438 days aboard the Russian Mir space station. YetBoyle noted that scientists often lack access to astronauts after they returnto Earth, and so it's difficult to carry out long-term health studies on spacetravelers. The recent study on toadfish necessarily took place on Earthbecause of its complexity in monitoring the animals' brain signals. But scientistshope to someday see similar experiments take place in space. "The experiment I'd like to do right now is ashort-duration launch profile done on a suborbital flight, where you recordneural activity during the acceleration of launch, the initial periods ofmicrogravity, and during the return," Boyle explained. Fish might also prove a good candidate for longer studiesthat send animalsto Mars or beyond, given that they can live for 40 or 50 years. Lab rats ormice would have long since died. Doing such studies before sending humans onlonger-duration space missions would seem prudent at the very least, accordingto Boyle. "When something goes wrong [with the inner ear],patients in the clinic are on the ground and they don't know if they're up ordown or swimming or flying," Boyle said. "In the wild, an animalwould be dead."